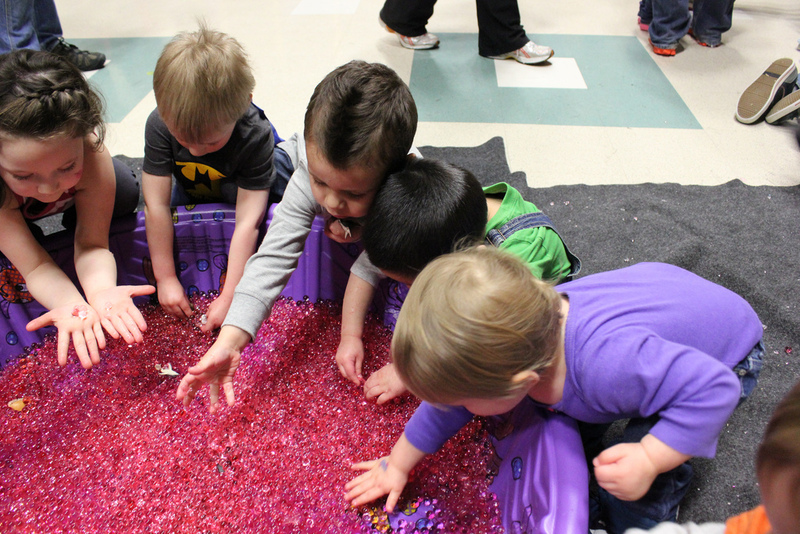 On Pinterest and blogs, you’ll find lots of posts about “water beads” and using them as a sensory item for toddlers and preschoolers. When my son was three, I got our first package, and they were a huge hit! They sat in a container on the kitchen counter all week, and every breakfast and snack time, he played with them – mostly moving them from one container to another and back again. Sometimes pretending that they’re dinosaurs chatting each other up. Sometimes just rolling them around with one hand while he reads a book, or squeezing them between his fingers when watching a video. He used tongs and spoons to move them back and forth. We’ve tried a few in the bathtub, but were careful that none go down the drain. You can do color sorting and counting games and more. They are really interesting and appealing to touch – they feel cool, wet, squishy but not squash-able (resilient), malleable. Fun to just run your fingers through. They’re interesting to look at – really beautiful – brightly colored, shiny, reflective, and they pick up all the light in the room (they look great on light tables). They bounce. Luckily, they don’t taste like anything at all or smell like anything yummy, so not a lot of motivation to eat, which is good. We usually use them in containers by themselves and let the kids sift their hands through them, but they’re also fun in a water table. (Be warned that if left in LOTS of water for several hours, they do tend to get overly hydrated and become much more fragile. You’ll likely end up with lots of broken fragments. If I want to use them in class the next day, I fish them all out of the water after class to store in a bowl till the next class.) We’ve also used them with the marble maze. Water beads are non-toxic, but that doesn’t mean they’re good to eat! If your child swallowed the dry ones, they could swell in their belly. (With the kind that only swell to marble size, that might be less of an issue, but there was a recall of a similar product called Water Balz that started out marble-sized and swelled much bigger. Very bad for little ones!) So, they should only be used with close supervision, and if your child tends to mouth things, consider some of the more baby-proofed options for water bead play described on Playing and Learning Begins at Home, such as putting them inside a transparent plastic container with a lid. Or, make edible boba (tapioca beads) instead… see this post for my comparison. Or, Fun at Home with Kids recommends basil seed. Apparently some brands stain clothing – the ones we’ve had didn’t. Some brands are squishable – kids can squeeze them into mushy blobs. The Biogel brand we had was very resilient and non squishable – they could be broken if you squeeze long and hard enough – my son broke a couple in half and was very upset but we “fixed them” with a little sleight of hand (swapping in a non-broken bead) and then he stopped breaking them. Want to see lots of posts on water beads and sensory play? Just search online! Or, go to our BC Parent Ed Pinterest board of water bead ideas. This entry was posted in Play and Fun Activities and tagged play, preschool, sensory, toddler, water beads on September 20, 2014 by Janelle Durham. My son and I paint with them by dipping them in paint than rolling them on paper.